My favorite item to get in my stocking when I was little was Navel Oranges! They are freshly picked from a local Arizona Orchard and are the yummiest thing to eat at Christmas Time! My favorite item to give now in my kids stockings are Navel Oranges! ha ha... I can't quit that tradition! Oh fun! We used to get oranges also--but then they stopped. I don't know why :). A couple people were just telling me recently that they used to get oranges as a kid and plan to carry on that tradition with their children. 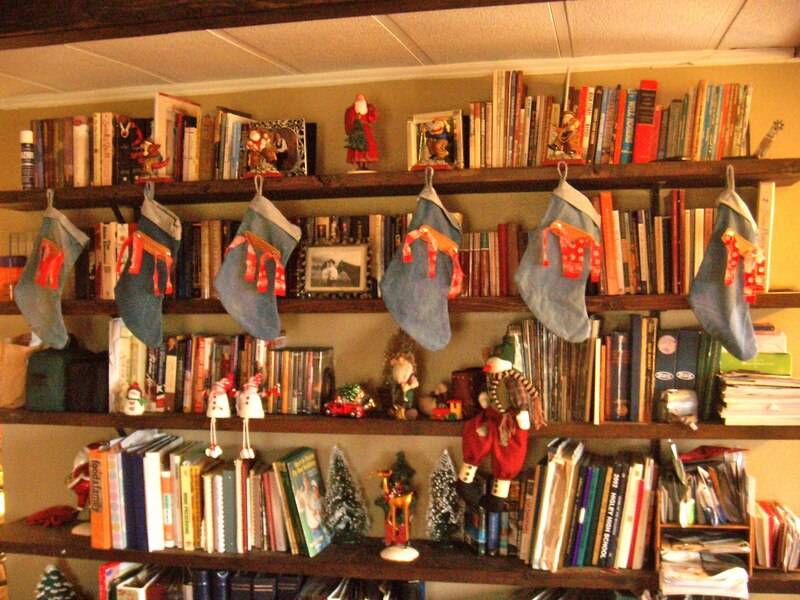 I love that the stockings are hanging on the bookshelf. I just picked up some oranges today! I have loved all of your stockings. They are just great! so cute. I love the denim stockings! Such cool cowgirl stockings! Love the idea of using jeans and bandanas! Super cute Stockings! Thanks for sharing them on Strut your stuff with the Six Sisters! We hope to see you again next week! I'd love to see a close up photo of the leather name tags. What a great use for old jeans. I like the orange tradition! It was a big deal for my mom when she was growing up in the 1930's because it was the only orange se'd get all year. They didn't grow in New York and she was from a farm family that produced all their own food (for the most art). I am totally a sucker for anything denim...I LOVE these.